One of my favourite food shows is “Come Dine With Me”. I will sit transfixed for hours watching people cook up a storm for 4 complete strangers. So recently, four of my foodie friends and I decided to host our own “Come Dine With Me” series of dinner parties. What a hoot! We tried to stick to the TV series’ format as much as we could, without all the drama, and of course we weren’t strangers to each other. Each person hosted one dinner party, serving 4 courses. We then voted on whose dinner was the best, (through a neutral friend) and the winner received a gift certificate to a swanky spa here in Vancouver. Honestly, it was so much fun. The cooks each had a few intense of days of stress, as they planned and cooked and hosted, but the rest was all gravy (so to speak)! Let me tell you, my friends can cook! We experienced some brilliant menus and some beautiful wines paired with the meals. The recipe I am offering you today was the second course for the dinner I hosted. I tweaked a recipe from a very fine cookbook: The Wine Lover’s Cookbook, by Sid Goldstein. This is one of my favourite coconut soups. The coconut and peanut butter round out the spiciness of the ginger. The lime juice and fish sauce deliver that subtle Asian aroma I have become so fond of. Oh, and for those of you who are wondering, no, I did not win the competition; but I know my meal was enjoyed by all of the guests: after all, that was all that really mattered! Perhaps as time permits, I will blog about the rest of my menu and some of the other fine recipes that were served up during our competition! I hope you enjoy this one for the time being! Place oil in a large stockpot and heat on medium high. Add onions and celery and sauté until onions are soft. Add garlic, ginger, and carrots and sauté for 5 more minutes until the carrots begin to soften. Add stock, chili paste, coriander, turmeric, fish sauce, lime juice, vinegar, peanut butter, brown sugar, sesame oil, and coconut milk and bring to a simmer. Cover and simmer lightly for 25 – 30 minutes. Let cool slightly. Using a hand blender, purée the soup until it is smooth. 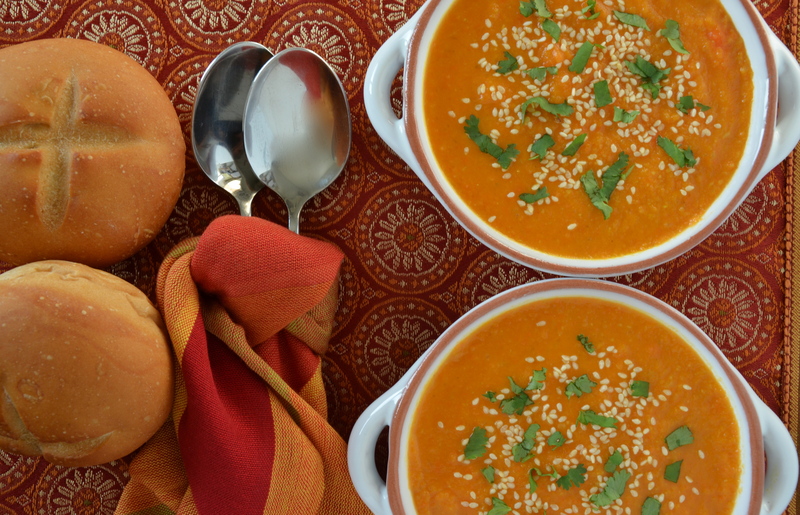 Ladle into soup bowls and top with chopped cilantro and toasted sesame seeds. This looks wonderful!! A great time of year for soup. Thanks Bernice! I appreciate that you stopped by my blog and took the time to comment! I agree; as the cold weather rolls in, I love a big bowl of hot soup. Entranced by your gorgeous photography, can’t wait to dig in! Well thank-you so much! I really appreciate the lovely comment and I do hope that you get a chance to make the soup! Cheers! Hi Eugene! Thanks so much for the compliment of re-blogging my recipe! I really appreciate that you took the time to stop by! Cheers! Hi Geraldine. Thanks so much for the lovely compliment. I decided not to quilt this winter, but now find myself quilting with photos of food! I guess you just can’t take the quilter out of the woman… Cheers! What a fun idea! I’ve enjoyed watching that show too. And this recipe looks delicious! Yes, it was so much fun and not really that hard to organize. I encourage you to try it with some cooking friends! Thanks for stopping by my blog! Well, thanks so much! I appreciate that you took the time to make a comment! (It also inspires me to keep working on the pics). Cheers! That is a very mouthwatering soup, with so many different flavors. I’m vegetarian; will try it w/o the fish sauce. Thank you for sharing! Yes, you could just make it with soya sauce instead and I’m sure it will be delicious! Thanks for stopping by! I do like the photo, the soup looks so tasty! Great variety of spices! yummy! So glad that you like the look of it! Hopefully you will get a chance to make it. It’s super easy and not a crazy list of ingredients! This soup has all my favourite ingredients wow! The photos look great!